I am an eyeliner hoarder! I mean I have enough that its sick. However with that being said, I always going through my eyeliners every few months and throw them out. 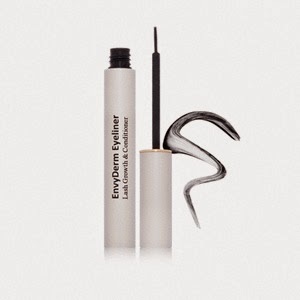 Recently EnvyDerm contacted Everything Beauty and Beyond to test out and review their eyeliner! This company is based out in the USA and they shipped it to me in Canada! I have been using this eyeliner now for about a week. First thing that caught my eye about this liner was the pretty packaging it came in. Now the real thing that made me go "wow" was that this eyeliner came with an awesome little booklet stating that this product is formulated without Prostaglandin, Parabens, Synthethic fragrance, Sulfates, Petrochemicals, Phthalates, GMO'S, Tricolosan, Mineral Oils and Animal Products to name a few. Now, for the good stuff! This product is formulated with Organic Moroccan Argan oil, amino acids and Panthenol to help make lashes healthier and stronger. What was also awesome about this product is that it is certified cruelty free, carbon free and Halal! This is pretty cool for anyone out there who is sensitive about using animal products in their makeup. Also, for anyone who follows a Halal diet/lifestyle this also allows them to use this product with no problem. I have to say, when I first cracked open this eyeliner, I was a bit scared since it didn't have a felt tip and was liquidity. Nonetheless, I have always said in the name of beauty, you go for it! Boy, was I amazed at this product and its ability to help you draw a straight line on your eye. I have tried with just about every form of eyeliner made (gel, pencil, liquid) to draw a straight line in one shot! Yeah that never comes out good! Yet with this eyeliner, I was able to draw a line with one straight shot! And I mean one good straight line! It wasn't rigidity or had jagged edges. Since the texture is very fluid, it draws on lovely and straight. I drew lines on the back of my hand with the liner and then tried rubbing it to see its durability and I was amazed on how well it held. However with that being said, keep this in mind. Your eyes secrete water and oils naturally. The back of your hand doesn't. So it's best when you wear any type of eye makeup that you always use primer to make it last longer and go on smoother. This held better and longer when I used primer. However when tried it without primer, it didn't last as long and flaked a bit. So primer I would highly recommend. I have to say, this is one of the best eyeliners I have ever tried and I am very glad I got the chance to use it! I have created (my first) youtube video talking about this liner! You can either watch it here on my blog or go to my youtube channel to check it! Sorry for the blurriness. My camera focus on my makeup counter and not me!! Eh!! Next video's should be so much better! I would say give this company a try if you are looking for a good liquid eyeliner with conditioning and enhancement properties! To win a free EnvyDerm Liquid Eyeliner all you have to do is three simple things! 1. Subscribe to my Channel!! 3. Tell me in the comments box Youtube what other eyeliners you tried and love! The contest closes SEPT 07, 2014 so be sure to enter! I will private message the winner! The company will send you the eyeliner directly!